Drilling template tool to ensure accurate drilling and tapping into stainless steel tube and bars. Drilling Template with options available to fit either 42.4mm or 48.3mm diameter tube. 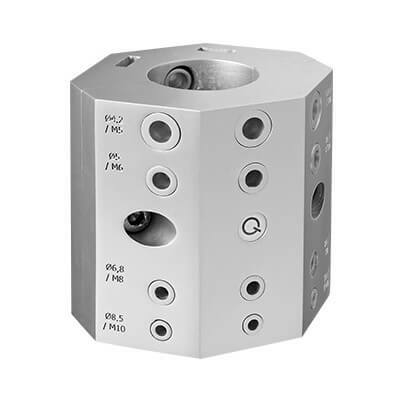 Suitable for M5, M6, M8 and M10 drill sizes. The octagon shaped exterior is designed to give a stable and safe position for drilling. 1. Loosen the hex head screws and remove the top half of your drilling template. 2. Place the tube into the bottom support and mark your drilling hole with a pen. 3. Replace the top cover and position the correct drill hole over your intended drill hole. 4. Once in position use a hex head key replace and tighten the fixing screws to ensure the tube is held in place. 5. Drill your hole, ensuring you drill directly in-line with the hole guide. 6. Once drilled release the top cover to remove your tube.